China recognizes it needs to make solid investments in its polar research infrastructure in order to continue to expand its ambitious polar research capabilities. Increasingly active in polar research, especially since the International Polar Year (IPY) 2007-08, China has made investing in its polar research capabilities a top priority. Having looked at China's plans for astronomy and glaciology at Dome A in our last instalment on China's expanding presence in the Arctic, SciencePoles now turns its attention to some of the major investments in infrastructure and logistics the Chinese have been making in their polar programme. In order to provide the necessary logistical support for developing Kunlun Station at Dome A – which is located at the summit of the Antarctic Ice Sheet in some of the harshest conditions in Antarctica – the Polar Research Institute of China (PRIC) has been doing extensive construction and renovation of its Zhongshan Station. Located at the coast, the Chinese plan to use Zhongshan as a supply hub for Kunlun, similar to how the US uses McMurdo Station at the coast to supply Amundsen-Scott Station at the South Pole. Underway since the IPY, much has been accomplished under the current renovation project. A new building housing laboratories and communal areas for up to 60 people has already been completed, as have two additional warehouses. The construction of a new power plant and winter accommodation building is planned for the 2012-13 summer season. The PRIC is also looking into the possibility of purchasing a ski-equipped Basler twin-engine aircraft from the US. The Basler will operate out of Zhonghshan Station, providing transport to Kunlun Station. It would also support any future inland research sites, including remote sensing operations over the East Antarctic Ice Sheet. As Zhongshan Station does not currently have a runway, China may negotiate an agreement with Russia that will allow its aircraft to operate from the Russian-maintained snow runway next to Progress Station, just a few kilometres from Zhongshan. An alternate solution would be to construct a new rock runway – if a suitable site can be found in the nearby Larsemann Hills, and if the Antarctic Treaty System grants permission. This idea has been floating around Antarctic circles for some years. It would provide intercontinental aerial access to this region of East Antarctica as part of the DROMLAN Antarctic aviation network, which is managed by the founding members of the Council of Managers of National Antarctic Programmes (COMNAP). With the completion of India's new Bharati research station some 10 km from Zhongshan and Progress Stations, this idea seems more likely. A rock runway built in collaboration would serve the interests of multiple nations and provide the necessary facilities for both continental flights within Antarctica and intercontinental flights from Australia and South Africa. The PRIC is also in discussions with an Icelandic company, Antarctic Trucks, about the possibility of using-low pressure tire vehicles (similar to those developed in recent years for recreational and adventure travel over the ice sheet) to ferry personnel and light loads between Zhongshan and Kunlun Stations. Unlike tracked vehicles such as Pisten Bully and Caterpillar tractors – which will still be used for transporting heavy equipment back and forth between the two stations – low-pressure tire vehicles should be able to cover the 1,220 km journey in just a few days. This will allow scientists to travel in an out of Kunlun Station more rapidly at a fraction of the cost of air transport. Beyond the support it will provide for the development of Kunlun Station, Zhongshan Station will also continue to support other inland research programmes such as glaciological and meteorological work, or the ongoing Chinese meteorite collection programme in the Grove Mountains. 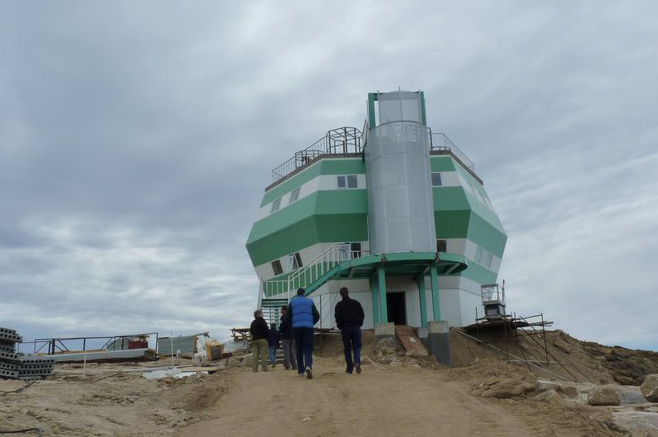 Under the expansion programme of the station, new on-site research facilities have been constructed at Zhongshan, including a new HF radar and aurora observatory to study and coordinate observations of aurora between China’s Arctic Yellow River Station in Svalbard and the Antarctic. Another major Chinese project to emerge from the IPY is the development of a second research icebreaker to operate alongside the RV Xue Long (Snow Dragon). Built at Kherson Shipyard in the Ukraine in 1993 and classified as an A2-class ice breaker (capable of breaking ice 1.2 metres thick), the Xue Long was originally designed for cargo transport in the Arctic. China purchased the vessel from the Ukraine shortly after its commissioning and made some modifications. Ever since, it has served Chinese polar research well. Not only has it been used for logistics and transportation, it has also been used for oceanographic research, including studies of the ice-atmosphere-ocean interactions in the Prydz Bay and Amery Ice Shelf regions in East Antarctica. The Xue Long has a busy 2012-13 season, with a trip to Antarctica’s Ross Sea region scheduled. Although the US, New Zealand, Italy, and South Korea already operate research stations in this part of Antarctica, the Xue Long’s mission will be to explore new areas for scientific observation, as well as a possible site for a fourth Chinese research station – if the Chinese are granted permission under the Antarctic Treaty System (ATS) framework. On this leg of the journey – in what is slowly developing into a longer-term cooperation programme between China and Australia – the Xue Long will also resupply Australia’s Casey Station. The Australians have been experiencing problems with the new snow runway at Casey, and have had to reduce the number of incoming flights from Australia. With the Xue Long busy supporting research missions in Antarctica, it has not been able to sail to the Arctic every year. This is why the Chinese have decided that a second ice breaker will be necessary if the country wants to meet all of its polar research ambitions. The new as yet unnamed icebreaker is currently under development following the contract signed in July 2012 between the Chinese Arctic and Antarctic Administration (CAA), the PRIC, and the Finland-based Aker Arctic Technology Inc. Design of the vessel in Finland is expected to last six months to a year. Construction will take place in China, with delivery expected in 2015. Its maiden voyage in the Arctic planned for 2016. Measuring 100 to 120 metres in length, the vessel will be significantly shorter than the Xue Long, but about the same width, between 20 and 24 metres. It will be able to break ice up to 1.5 metres thick, and sail within a range of about 37,000 km. Capable of carrying 8,000 tons, it will have enough room to accommodate up to 90 crew, scientists, and logistics personnel, and will house 580 m2 of research laboratories. It will even be able to transport a helicopter. With retreating Arctic sea ice opening up new shipping routes and creating new resource exploitation opportunities, copuled with China's ambitions to gain observer status on the Arctic Council, China’s new icebreaker will serve as the principle operational platform for increasing the country’s presence in the Arctic, both scientifically and strategically. Whilst China’s Yellow River research station in Svalbard focuses on magnetic and atmospheric research, the new icebreaker will build on the ice-ocean-atmosphere interaction research the Xue Long has conducted in the Arctic since the IPY. According to plans currently being developed, the new icebreaker could conduct up to two research cruises to the Arctic during the summer. This would allow for long-term monitoring of changing Arctic marine environments and allow them to make observations that would provide insight into how a changing Arctic might influence weather and climate in China. The vessel may also test and monitor new shipping routes across the Arctic Ocean, in the same way as the Xue Long has already done. 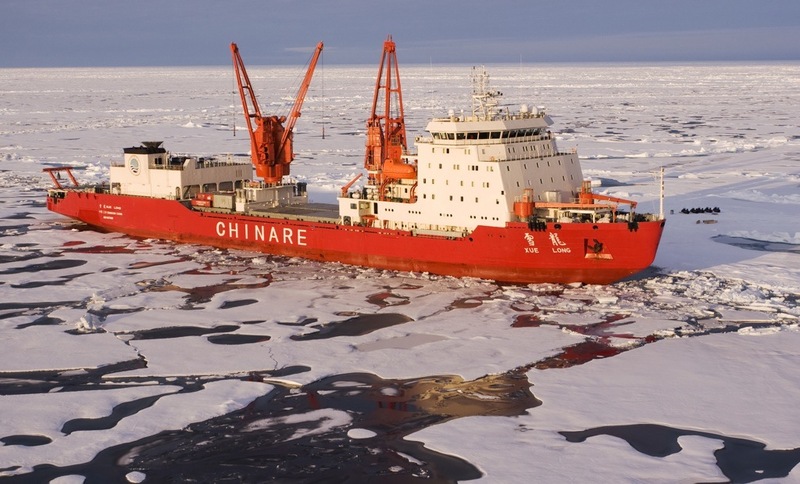 On a return journey to China from an official visit to Iceland in August 2012, the Xue Long took advantage of the largest summer sea ice retreat on record and attempted to cross the Arctic Ocean via the North Pole. The shortest route from China to Europe, it may be a future shipping lane for Chinese exports and cargo. 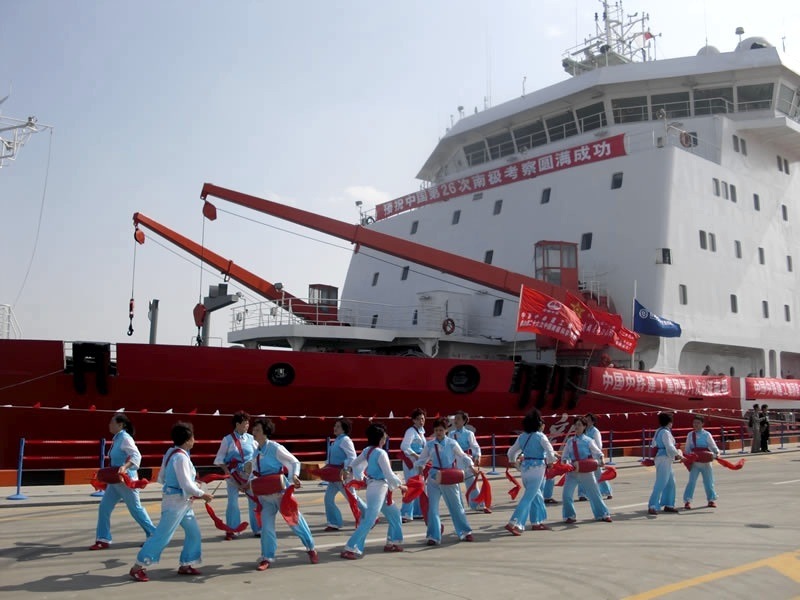 China’s expanding Polar programme and interest in the wake of the IPY also requires expanding research and logistics infrastructure in Shanghai, home of the Polar Research Institute of China (PRIC), the Xue Long, and the eventually the new icebreaker currently under development. With the necessary land already secured in Pudong along the shore of the East China Sea, plans are in place for the construction of a new base for supporting polar expeditions. Plans include a new pier alongside an existing one for the Xue Long, a research campus, an international data centre, a storage facility for ice cores and other research samples, and a conference centre. The PRIC is in early talks with the International Polar Foundation about the construction of a POLARIS Climate Change Observatory (PCCO) on the same site. The PCCO is envisioned as an interactive platform to inform and educate the general public about Polar research and climate change.